Start The ‘Fleur-de-lis’pub. It’s usually possible to park around the village green. Leigh Rail Stationis further down the road which passes the side of the ‘Fleur-de-lis’ pub. Comment Leigh village is an attractive place with many buildings of character. A generally easy walk with some stiles and occasionally muddy bridleways. Pleasant walking in Haysden Country Park. From the ‘Fleur-de-lis’ pub turn left down the road at the side past the car park and then immediately left again down Kiln Lane at the back of the pub. At the end of the lane, pass through a gap into a road. Turn left and follow the road as it winds around (ignore a close on the right). Look for a footpath going off right just before no. 28. This soon becomes a road and bears left to the village green. Turn right along the edge of the green. Ignore the first turning off right (Green Lane) and continue to the next turning right. Go up here. At the end it becomes a footpath going on in the same direction, down and under a railway. Go on in the same direction for a good distance, first up a slope and down to a metal kissing gate, then on up a field with a hedge on the right. At the top corner cross a tractor bridge. Keep forward across a large pasture towards a treeline at the far side. As it becomes evident, aim for the end of a metal river bridge. Reach and cross the bridge and bear left to a second, concrete, bridge. Over this there is a junction of tracks in the trees. Go straight across and down to a squeeze stile by a fieldgate. Enter a field. Ignore a path off right and go on in the same direction with the hedge on your right. At a corner, by an old fence post, bear diagonally left, past a lone tree, across to a stile in a fence. Cross this and turn left along a field with the fence on your left. At the end reach a ditch. Cross a tractor bridge and continue on across the next field to a wooden gate at the far side. 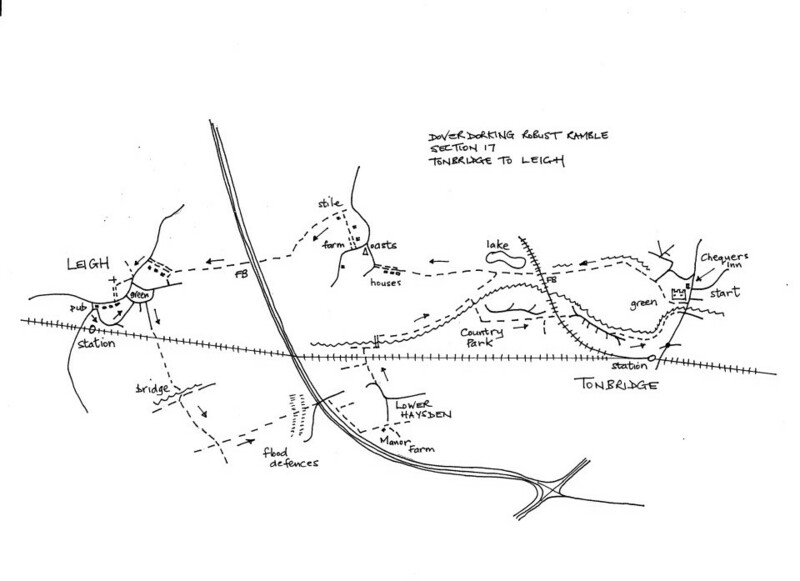 Through this, follow a bridleway (pleasant in summer, churned up in winter) for some way. This becomes a cycle track. Go up over a massive flood defence bank and down to reach a road by a car park. Go forward under a large motorway style bridge. At the far side turn immediately right off the road through a gap in the hedge and over a stile into a field. Keep up the field edge with busy road on the right to another stile in the top corner. This has been slightly crushed by a fallen tree. In the field ahead continue up the side to a better stile and cross into an enclosed path. At the end cross yet another stile and turn left down a field with a fence on your left towards houses. Leave the field through a metal fieldgate (it drops heavily as it is unlatched) into a garden area. Bear right across to the timber framed Manor Farm House. Go down the entrance drive, passing the house on your right, to a road. Turn left down this to reach a junction at the bottom at Little Haysden (there was once a pub here now closed). Go straight across the junction and up the road ahead. Soon it turns left. Leave the road and keep forward up a bridleway which is part of the Weald Way. At the top swing left then right over a wooden footbridge, following Weald Way signs to reach a railway. Ignore a footbridge at the side of the railway bridge, instead dive down to follow a narrow path on a ledge going under the railway. Keep on to a T-junction of paths. Turn right here with a river over on your left. Soon reach a footbridge on your left. Cross this and turn right to follow the river, now on your right, for a good way. The track soon becomes enclosed in trees. Eventually reach an old iron bridge on your right. Cross this towards the Haysden Country Park. Soon cross a second bridge. Bear right and follow the trees on your right but do not enter the wood. At a junction of paths keep straight on, bearing slightly left, away from the wood, into a more open area planted out with bushes. There are houses over on your right. The path is easy to follow between hedges. At the far end the path goes on by a roadway to meet a footbridge over a railway. Cross this and go on up to a road. Go straight over to continue up the road ahead (Barden Road). Stay on this road, past a side road on the left, and on, swinging right, to continue along by a long hedge on your left. After some way pass a corner shop on your right, keep on to reach a Dental Surgery on your left. Immediately past this turn left down a wide path and follow it with a river on your left for some way. Ignore the first bridge over the river and keep on past the side of buildings to emerge at a grassy area. Bear left, still with the main river on your left. Cross a bridge over a weir, and keep on up, still with the main river on the left. Pass car parks on your right, but still keep the river over on your left. Tonbridge castle should be appearing ahead aim for this. Finally follow a broad riverside walk along by the river to emerge onto Tonbridge High Street. Turn left over the main road river bridge and soon reach ‘The Chequers’ inn and the start of the section.